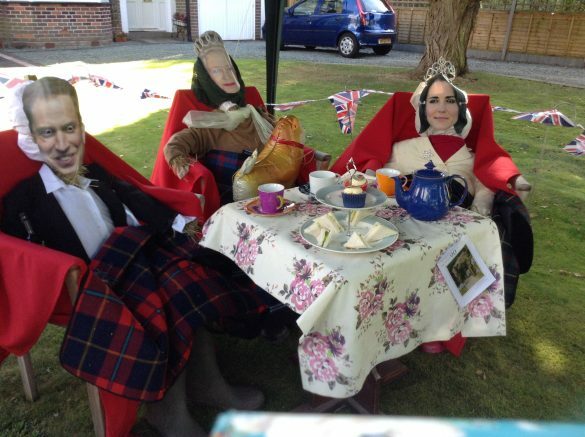 As Clerk of the Parish Council I was delighted to be asked to be one of the judges for the Tidbury Green 2016 scarecrow competitionalong with Pam Cole who lives in the village and Lorraine Hart from Age UK. The three of us had a great time judging and we were very impressed with the quality of the entries. People had put a lot of thought and effort into designing and making their scarecrows. We completed independent scoring as we were taken around by Pauline Fisher, to view and judge the scarecrows. When we finally returned to the school hall and sat down to discuss our scores we were unanimously agreed on our three winners. Second Place – The Hickey Family from Lowbrook Lane, where the queen was sat upon her “throne”. A great example of British humour. Thank you also to everyone who entered the day’s competitions. Without the support and participation of you all these great events would not take place. The Social Committee would like to thank the group that meet at the school hall that was used to host the event, for entering into the spirit, by submitting cake and flower arranging entries and adding material in support of the day to their noticeboards. It was really appreciated.